My passion for Disneyland Paris dates back to October 1989, when my Dad invested in Euro Disney S.C.A. (EDL) shares. Financially this was a less-than-stellar move, but from that moment on we started received Annual Reports through the post, updating us on the construction of the park. Needless to say, I was hooked! Then on the 20th of April 1992, I was very lucky to visit Euro Disneyland just 8 days after it opened, which was a truly magical experience that left a very strong impression on me. So it was particularly meaningful when, on the 12th of April 2018, I received an email from Disneyland Paris inviting me to join InsidEars and become “an official online ambassador for Disneyland Paris”. InsidEars is the name of Disneyland Paris’ new social fan club for fansites and influencers. As someone who has written over 65,000 tweets about the resort, of course I replied “yes”. What a fantastic opportunity! 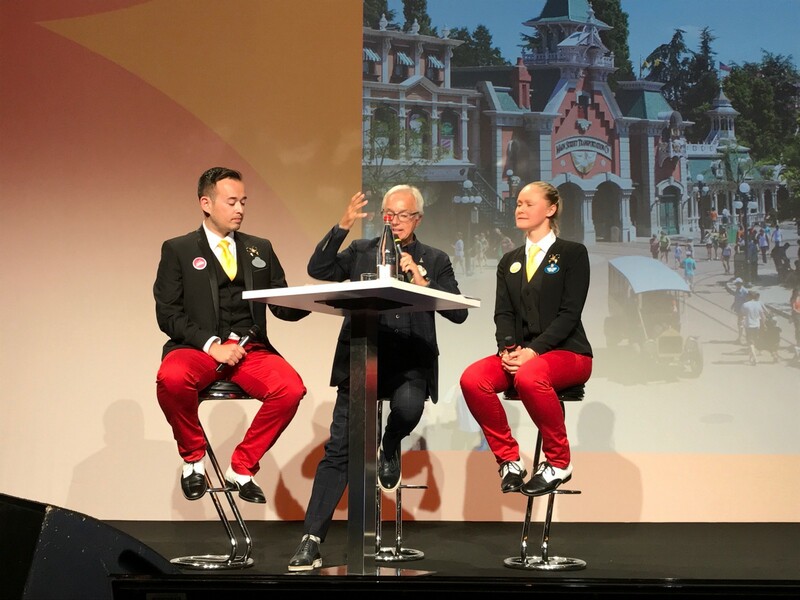 The event will be full of surprises, including a special discussion with Daniel Delcourt, Chief Operating Officer of Disneyland Paris, about the latest exciting updates and our company’s strategy. We will have moderators present to run the event to ensure everything goes smoothly. From now until May 11th, you can send me the questions you (or your readers) would like to ask. The most popular questions will be grouped by theme for Daniel to answer during the event. This is a special chance to discuss, understand, and learn even more about the place you love so much! Naturally, I wrote back with 15 questions! I’m not sure if any of them actually got used, but it was nice simply to have contributed. Finally, on Friday the 18th of May 2018, I attended the InsidEars Ready! 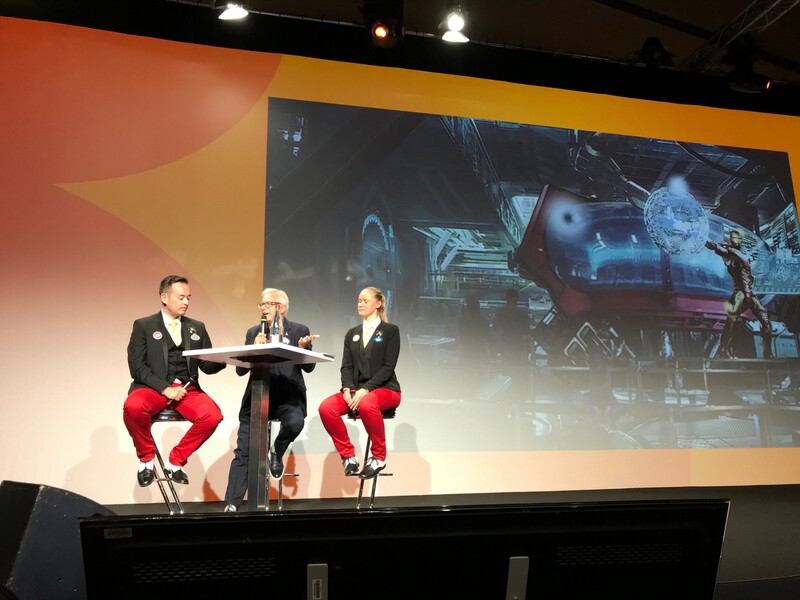 2018 launch event at Disneyland Paris, as one of the 150 founding members of the club. 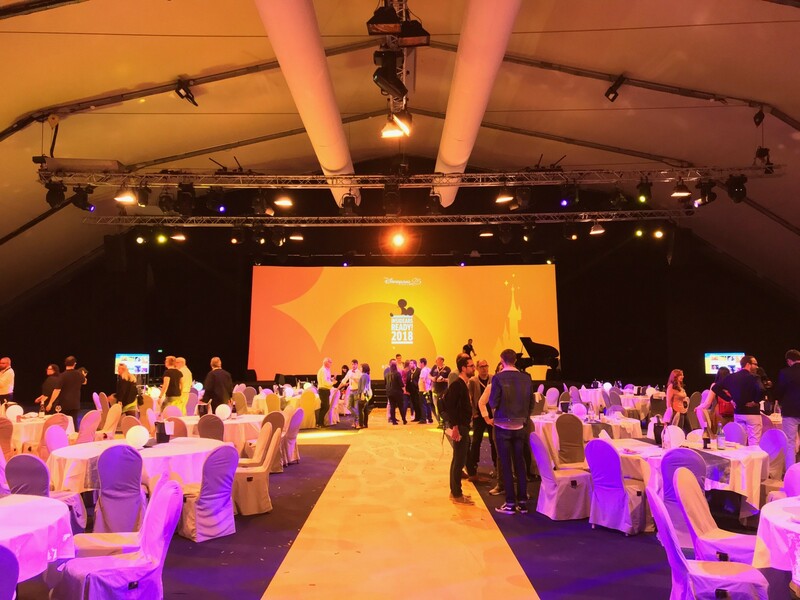 The event was held in the Times Square room at Disney’s Hotel New York Convention Center, running for 4 hours from 7:30pm to 11:30pm. 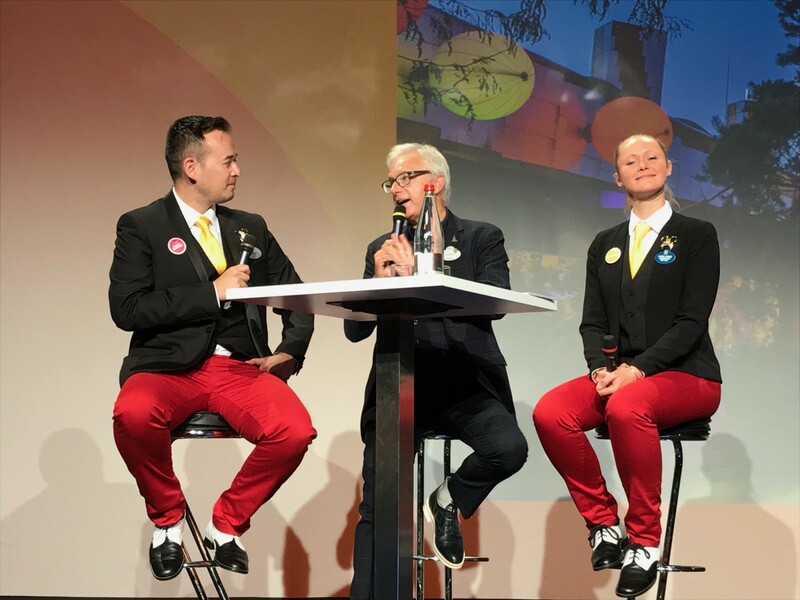 The event was slickly organised and expertly hosted by two Disneyland Paris Ambassadors: Laura Janice Gedigk (2018) and Jonathan Rabeute (2013-2014). For me, the most interesting part of the event occurred at 8:05pm, when Daniel Delcourt came out on stage and answered 13 of the 500 questions we’d all sent in. He spoke entirely in French, which is always an issue for monolinguists such as myself. A live English interpretation was provided via a Sennhesier HDE 2020-D headset, but some things got lost in translation, and unfortunately no recording of it was supplied. Jonathan: Well then, how about we start the evening now, ladies and gentlemen? Laura: So, ladies and gentlemen, as you may remember, a few weeks ago, a few months ago, you sent us your questions. Many, many, many questions; we received more than 500 questions! We gathered them all, we sorted them all, and tonight we’ll start answering some of them. Jonathan: And to do so, ladies and gentlemen, let’s all welcome our Chief Operating Officer, Mr. Daniel Delcourt! Jonathan: I hope no one is in a rush. Daniel: …and you will be eating at two in the morning. Jonathan: We’ll make it a bit shorter. Daniel: We’ll make it shorter. Jonathan: Please make yourself comfortable right here. Daniel: Alright, let’s go. So it’s a real pleasure, a great pleasure to be here with you. Daniel: Yes, so, first of all, this shows you the level of commitment of the Walt Disney Company. It’s thanks to them, by the way, that the Walt Disney Studios are going to become such a wonderful park. And this is the most ambitious plan in the history of Disneyland Paris. You have to know that. So as you can see behind me, in front of you, three new areas will be created to form the future of the Walt Disney Studios. First area: Star Wars. Second area: Frozen. And the third area will be the Marvel universe. Of course we’ll be starting with the Marvel universe this year, but these are the three areas that will be coming to the Walt Disney Studios. Daniel: Listen, sincerely, it’s… We’ve never seen anything like this in Disneyland Paris. It’s such an incentive for our Cast Members. 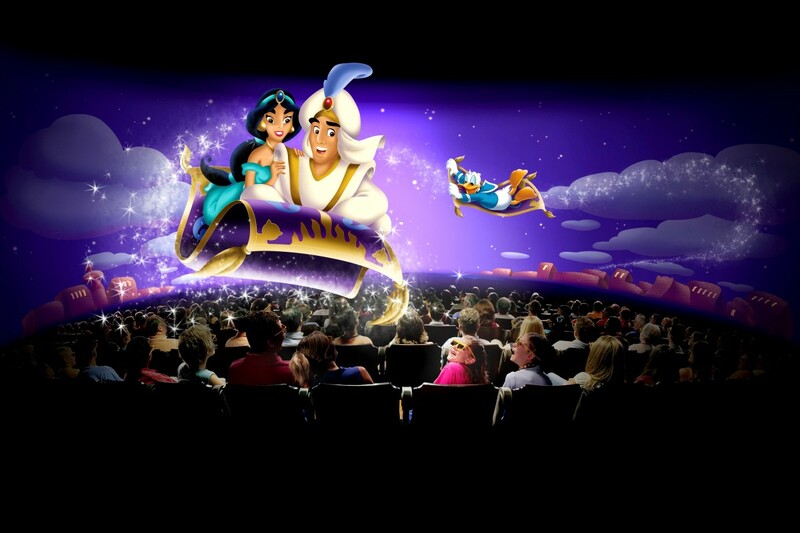 When they learnt about this investment from the Walt Disney Company, their sense of belonging increased tenfold! Sincerely, everyone here at Disneyland Paris is very proud of this investment. And I’m sure, I will put all my money on it, that all our Cast Members will have a stake in this development. Daniel: Yes, of course. As you know, we are the top tourist destination in Europe, so we had to develop premium products for Disneyland Paris. Premium means exceptional. Disneyland Paris is exceptional. So we had to create new products in order to develop the “premium” product. First we put together a team, because of course we needed Cast Members to take care of… Simply put, NOTHING happens without our Cast Members. So we needed a team dedicated to this approach. Of course, the marketing team was involved, but some time ago we created the Disney Special Activities team. Through Disney Special Activities, we have created new products. We also have the marketing team, and the Operating Cast Members went over our range of Annual Passports. We also created new Signature Collection Packages for Disneyland Paris. This is brand new, and it will be implemented very shortly. 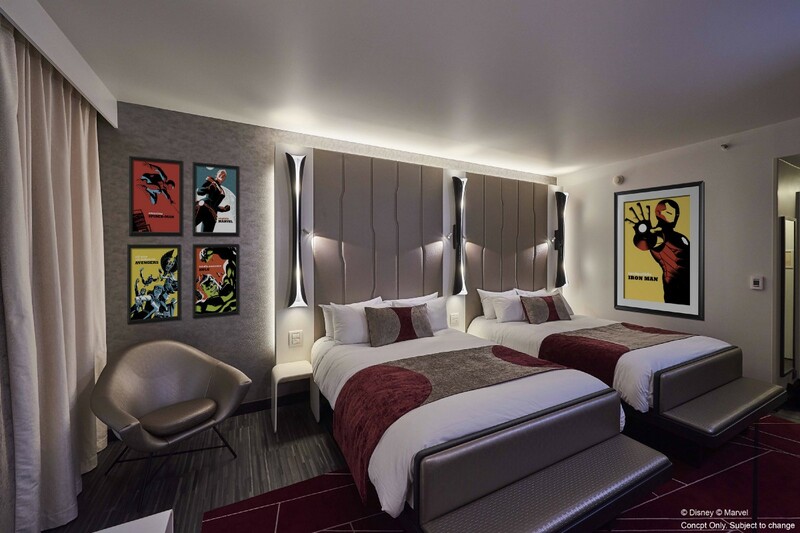 There will be the Signature Marvel Package, which includes many surprises: dinners, character meetings, private ones, all of which will be bundled with the hotel. And we also have a Signature Celebration Package. The Celebration Package will allow you to take your friends, or come with your family, to celebrate an event: a birthday, a communion, a wedding anniversary… I know that everyone likes to celebrate various things in Disneyland Paris, so they’ll be able to do it in Disneyland Paris, at the Lucky Nugget! In order to launch this premium approach, we needed an exceptional product, a product that will happen very very soon, the event of the year, the FanDaze event! With FanDaze, as fans, you’re going to be blown away by the products you will discover at this event. But we have already started the premium approach. We had already anticipated it, a few years ago, with new shows, such as Mickey and the Magician. I have to say, Mickey and the Magician is a great success. Working alongside Catherine (Powell), we put an emphasis on 25th Anniversary products, which are still relevant since we will be celebrating the 25th Anniversary until September. With Catherine, we also put an emphasis on the new seasons. 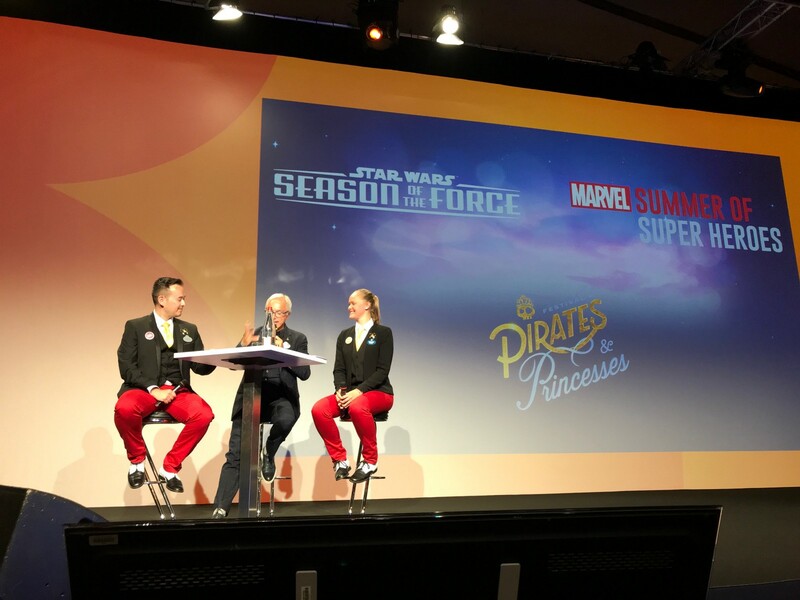 So we had the Season of the Force, we had… we still have, right now, the Festival of Pirates and Princesses, and we will soon be entering, on the 8th of June, the Marvel universe with the Summer of Super Heroes. And for next year, we’re currently building a brand new theatre. A brand new theatre instead of the Chaparral Theater. A brand new theatre that’s being built by the Disneyland Paris teams to welcome, ladies and gentleman, the return of The Lion King! Next year is going to be exceptional. By the way I have a scoop for you, because I didn’t come empty-handed… We are going to welcome a product that has already proved its worth and become a reference in the United States on the other side of the Atlantic Ocean. 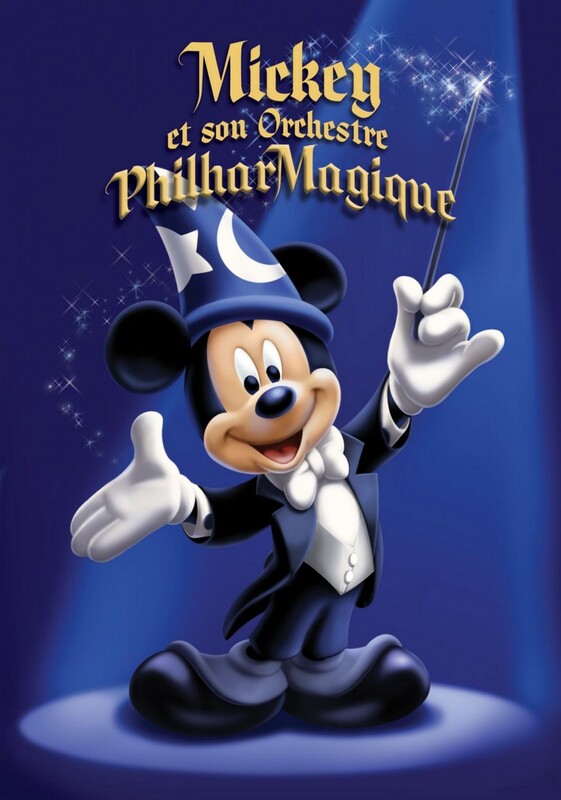 From October of this year, we are going to welcome Mickey’s PhilharMagic at the Discoveryland Theatre. So that’s it for the premium approach. Jonathan: Great. So you talked about the 25th Anniversary. It was a great success. To prepare for this 25th Anniversary we all remember that there were extensive refurbishments. Will there be more in the future? Daniel: Many, many questions that you sent us were about refurbishments. So yes, we will keep the momentum going, so that we keep the park at the level where it should be. So we will refurbish the Rock ‘n’ Roller Coaster which will be transformed in the Marvel universe into Iron Man Coaster, with lots of magical effects inside this attraction. And of course we will, and we have to, it’s not because… You’re going to tell me: “But this attraction is brand new, why are you going to close Ratatouille soon, at the end of August, until December, to refurbish it when it’s brand new?” No. There is a problem with the floor of the attraction. The floor is wearing down, and as you know, the vehicles are connected via Wi-Fi and virtual connections. And we have problems in the attraction because each time they pass over a hole, they get disconnected from the vehicle in front, which causes technical problems in the attraction. So we have to redo the floor of the whole attraction! There were many questions about the Mark Twain! Is it still here? Yes, it’s still here, and we will start refurbishing it in 2019, so that the Mark Twain can come back in 2020. And we also had questions about the castle turret toppers. As you know, during the strong winds last winter, a turret topper fell off the castle. Since safety and security are key here at Disneyland Paris, we decided to remove all of the turret toppers and make sure we check all of the castle structures so that we can put the toppers back on the castle. The toppers will be back before July. We’re also going to refurbish the Tower of Terror. We will start putting up scaffolding on the 3rd of May. Dear fans, please don’t be scared. The scaffolding will go up with a white tarp, because we need to put the scaffolding up in its entirety to take exact measurements to then create a themed tarp. It always happens this way, because we never have the exact dimensions on the computer, so we will first put the scaffolding up with a white tarp, and then the themed tarp will come back. Refurbishment is an on-going program. We cannot stop refurbishing the assets of Disneyland Paris. And I know that one of them has been subject for debate: Big Thunder Mountain. Big Thunder Mountain was closed for a year, and we had numerous technical problems when it reopened. I’m going to explain why, quickly. We developed new trains, and we discovered that the new trains ran a lot faster than the old trains. And as you know, it would be very easy if we only had two trains in the mountain. One of them runs, when it pulls into the station the other one goes, and there’s no problem. But we work with five trains, and we have sensors throughout the mountain. So if one of our trains passes the sensor a millisecond late, automatically, for safety reasons, the attraction stops. You will understand that we cannot take risks in this matter. So the engineers worked on it, because the speed of all the trains had to be re-calculated and so on, we fixed it, it’s a lot better. But you’re going to tell me, “yes but there are still technical problems”. I’ll get back to it. In the specification, there was a special effect inside the mountain: the explosion with smoke. We have a problem. We drained the lake to install the new special effect, which is housed on the other bank, and that’s where all the smoke effects originate from. But there is a leak. There is a leak and we’re trying to find solutions so that we don’t have to empty the whole lake. We’re working with the teams to find a solution to fix the leak and make sure the special effect works again. But you’re still going to tell me, “oh there are still technical problems”. Perfect timing! This morning I was with my teams, we have a meeting each month about the efficiency of our attractions, and I will have you know that, today, most of the problems we encountered, the 101s since we speak the same language, were unfortunately due to our guests’ behaviour. They don’t get on the trains quickly enough. You know, we only have two minutes to load the trains. Two minutes to get everyone out, and everyone in. We often get guests who panic, who need to get out, and if we go over two minutes by just a second, automatically, security is implemented and we cannot launch the trains anymore. So you have to know that this is the majority of our 101s. And you have to know that we also created a team of eight engineers who are dedicated, every day, to the technical problems on our attractions. And you also have to know that we have transported six million more guests this year than last year. Because, most of the time, we focus on technical problems. But let me say, today, the reliability of our attractions is at 97%. That’s the rate of reliability for our attractions, and all the attractions that have been refurbished exceed 80% for guest satisfaction. Daniel: Yes, so, Hotel New York is going to be amazing. It’s being redone from top to bottom, we’re changing everything. Here you can see a few photos that you might have already seen, but this is the bedroom. For now, this is what we call a mock-up room. It’s a test room, where we test the equipment that our guests will see and experience when they come to stay. 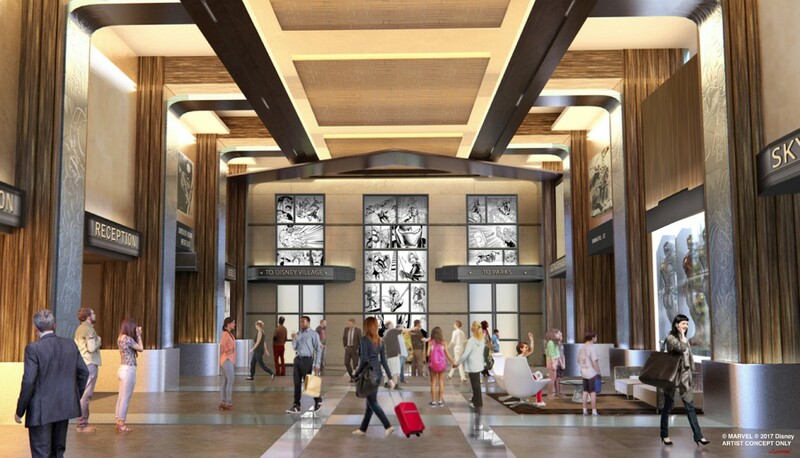 But you have to know that it’s not just the rooms, the corridors or the lobby; everything will be redone to fit inside the Marvel universe. And the next one will be the Disneyland Hotel. I presented — this time unfortunately I don’t have any scoop for you — but we presented Catherine with our designs two days ago, and she was delighted. So believe me, this will also be a new immersive experience into a world that you will discover later. Jonathan: Of course we will keep you informed via InsidEars, Daniel. Daniel: Precisely! And to create more magic inside our hotels, we brought back the characters from their worlds within the parks. Every morning, there are characters inside our hotels. We’ve also improved Extra Magic Time. We’ve opened both parks, and today there are 11 attractions that are open every morning for our hotel guests. 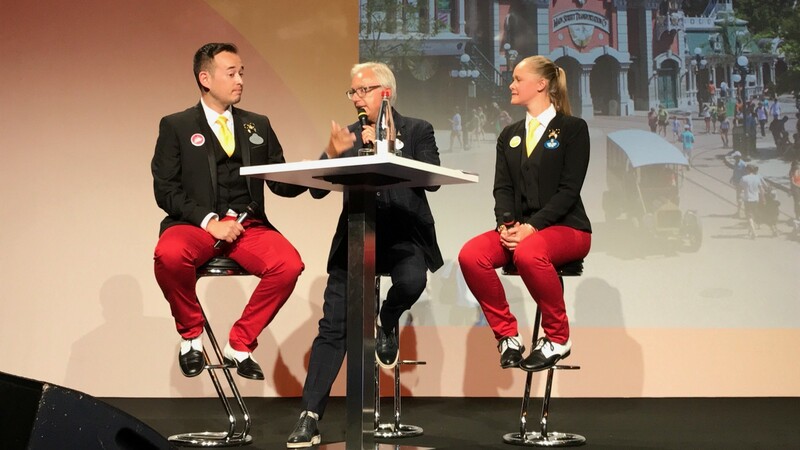 And we’ve also welcomed our youngest (Disney Hotel), if I may say our youngest: Villages Nature, which is now part of the Disneyland Paris family. Jonathan: Thank you, Daniel. 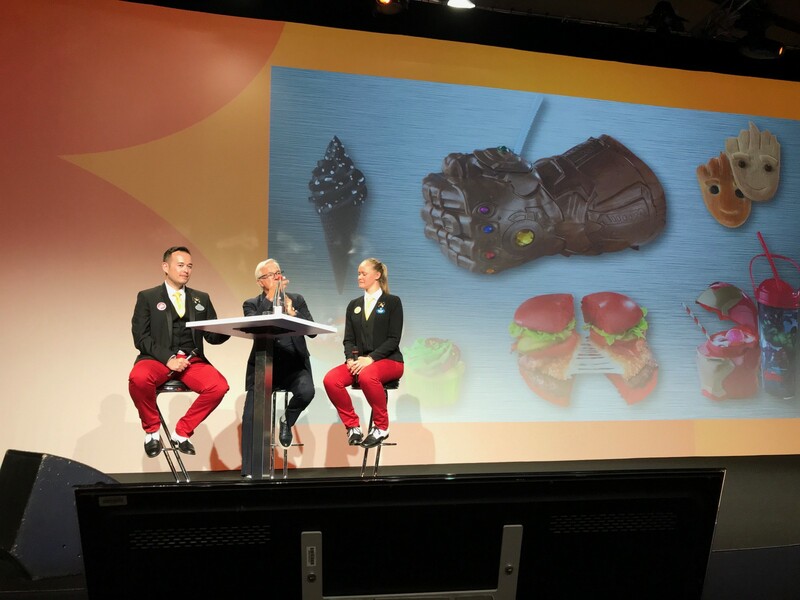 We’re now going to move on to food, figuratively anyway, since you’re going to tell us more about the future of food at Disneyland Paris. Daniel: We’ve been working on improving our products for the past three years. We made sure to go over the products in our buffets, and we also worked to create a connection between the products you will find in the menus and the location. So what was left for us to do? Well we had to go over the counter service products. We have a new Catering Manager, who arrived about three months ago, called François Charpy, who comes from that world. He comes from the world of fast food, so we’re currently rebuilding the fast food strategy here at Disneyland Paris. Of course, you will find products connected to the seasons. Let me show you a few things, you’ll see. So this is what you will be able to enjoy during the Marvel season this summer. It’s a mix of developments that come to us from the United States and creations from Disneyland Paris. You will be able to enjoy all these products very shortly, and we will of course develop more products to go with each season. There is also Mobile Ordering trial that will take place this summer in Restaurant en Coulisse. You will have the opportunity to book a time slot to pick up your meal inside Restaurant en Coulisse. We’re going to do some tests, this is part of the digital approach, and we’ll be doing a live trial this summer. There has been a lot of talk about Pizza Planet. What’s happening with Pizza Planet? Pizza Planet is finished. It’s finished. Yes, that’s how it is. All good things come to an end. But we need extra room. Why? Because this hotel (Hotel New York) will be closed for quite some time, and we need more hosting space. So we bought the COP21 tent (a reference to the 21st Conference of Parties, held in Paris in 2015). It fits in our environmental approach, and we’re going to put up a structure where Pizza Planet was that will allow us to host events and also create new premium products. So that’s what will happen instead of Pizza Planet. Then there are rumours! Starbucks is coming to Main Street! Daniel: No! No, no, that’s not true. Starbucks is not coming to Main Street. But we’re going to close Colonel Hathi’s next year, so that we can transform it completely. That will come with a surprise, which I will talk about next time. But yes, we’re going to transform Colonel Hathi’s in its entirety. So that’s it for food. Jonathan: It’s making me hungry. Daniel: Yes, Laura. We don’t have a choice. I do think it’s true that we are behind when it comes to the digital approach. 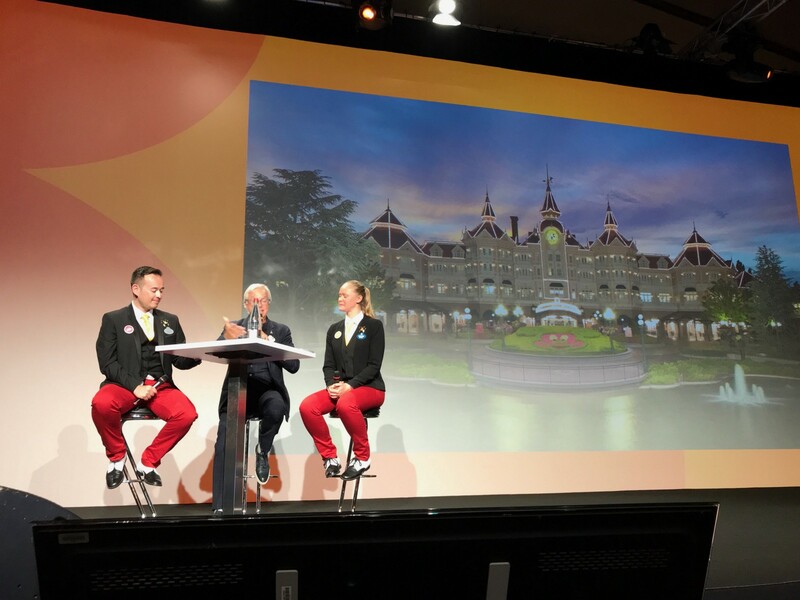 You have to know that Catherine has put an emphasis on the digital approach, and we have a new manager in charge of digital development at Disneyland Paris, with an entire team dedicated to the digital approach at Disneyland Paris. We’ll start seeing results. Daniel: Vouchers, vouchers! If you stayed with us for two days you had roughly 54 of them. You had to make sure you found all your vouchers if you wanted to have breakfast or dinner anywhere. That’s over now. Everything is included in a small card, a card you can see here, the size of a credit card. No need to exchange your vouchers anymore, to try to find them, to lose them, and so on. 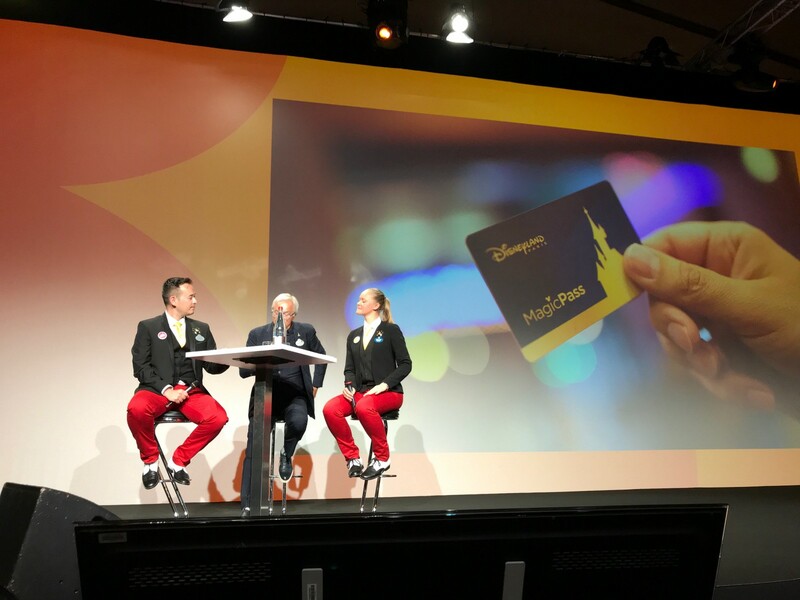 Everything is on the card, and that’s a great step forward not only for our guests but also for our Cast Members. And we’re going to keep doing trials with online reservations in our restaurants, for example. And also there will be a trial, as I was saying earlier, in Restaurant en Coulisse this summer, to see how it all works. And I know you’re going to ask me: “What about Wi-Fi coverage in the park?” It’s coming, it’s coming. There will be full coverage at some point next year. That way, all the parks will have Wi-Fi coverage. Daniel: No, no, it’s a rumour! Jonathan: Is it still only a rumour, Daniel? Laura: They’re already very happy. Daniel: Unfortunately, I’m going to disappoint you. No, it’s only a rumour. I think that each park has to have its own digital approach. We’re talking about Disney World. Disney World — I suppose you’ve all been there — is huge! And the MagicBand cannot be adapted to our own structures. But we’re making progress. The proof is the MagicPass, and we are still working with the digital team in order to expand the digital part. Daniel: I think that it’s a subtle mix of Disney magic and European cultural heritage. I think that we mustn’t forget where we come from, and we must make sure there always is a certain compatibility between European culture and Disney magic. And also, and I’m not the one saying this, it’s Catherine, our President, who said it, she fell in love with our castle. Even if she is now at the head of three parks, of three resorts, sorry, she said to me just two days ago: “I want to take the castle with me.” I told her it won’t be possible, she’ll have to leave it with us, but I am convinced that we have the most beautiful castle of any theme park. Jonathan: George is the President of Disney World. Daniel: …is the President of Disney World. And other unique products such as The Forest of Enchantment, which I always thought was so magical, full of emotions. So, all these things are being coveted, they want to have them too. And we’re very proud of that, and our Cast Members can be very proud too. And we also have our resort area, which is the fifth biggest in France, now that Villages Nature is included. So these are the things that set us apart and make up our strength. You’re already familiar with Magic Run Weekend, so this will be the third year in a row for Magic Run Weekend at Disneyland Paris. Electroland for the second year running, over two evenings this time. And also, for the first time, there will also be a musical event which is called, which is called… Disney Loves Jazz. Sorry, I couldn’t think of the name… Disney Loves Jazz! And in September, the Rendez-Vous Gourmand de Disneyland Paris will be back for a second season. Last year we focused on French regions. We’re going to expand this event because this year we will have six extra kiosks. So we had French regions, we’re going to add another one, but for that one you need to ‘get on a plane’ and cross the Atlantic Ocean to get to the West Indies. So this year we will have a kiosk dedicated to West Indian products. And we’re also going to open up and cross European borders since we will have a kiosk with Italian products, a kiosk with Spanish products, and since I am from Belgium, I needed my own kiosk, so we will have a Belgian kiosk. So that’s it about the Rendez-Vous Gourmand de Disneyland Paris. Jonathan: And it will last longer, won’t it? Daniel: Yes it will, because the Rendez-Vous Gourmand de Disneyland Paris will start on the 27th of July. Jonathan: To make the most of the outdoor seating areas. Jonathan: While we’re on the subject of outdoor seating areas and entertainment, let’s move not far from here to the Disney Village. As we all know, it’s different from Downtown Disney in California and Disney Springs in Florida. Can we expect some changes? Daniel: Right, of course, I don’t think you can compare them. You can’t compare them, these three places are completely different and they all have their own charm. For those of you that I’ve already met, you’re going to say: “Here we go, Delcourt is going to tell us once again that they’re working on it…” And it’s true, we are working on it. And you’re also going to say: “But you’ve been saying that for four years now and nothing is happening!” Well this time I can tell you that we’re 90% there. 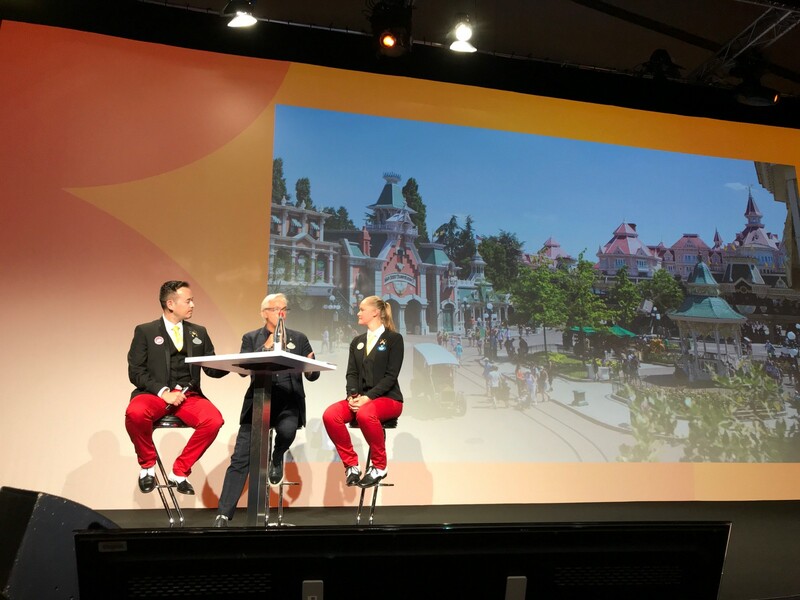 We’ve been working with our American colleagues and with the Disneyland Paris teams, and we almost have a plan for the Disney Village. But 10% of it still hasn’t been approved, so we’ll keep you updated. But this time it’s more than just words, it’s going to happen, and soon. Laura: We all know that character meets are key events during a visit to Disneyland Paris. Will these meets develop into a special evening with an opportunity to meet rare character, Daniel? Daniel: For the past four years, we’ve worked hard to add more characters to the parks, and we will keep doing so. You can’t imagine a park without characters. It’s the heart of the product, and the heart of the product has to keep beating. So the characters will be there, and we will keep developing their presence. As I told you earlier, characters are also back inside the hotels and at Café Mickey. So they are back. And the climax of this will be the FanDaze event, where you will be able to meet 80 characters, some of which will be extremely rare. This shows our commitment when it comes to characters. Daniel: Well, I had a big shock when I arrived in California. I’m a Disneyland Paris baby, I grew up here. 22 years ago I was carrying plates in the Hunter’s Grill restaurant, I owe everything to Disneyland Paris, and I only knew the world of Disneyland Paris. So when I arrived in California, I thought: “Ouch… Now that’s different.” It’s the park where Walt walked, the park where Walt lived, since he had a apartment there. So it’s more than a theme park, it’s an institution. So when I got there, for me it was a dream come true, and I was in an institution. And I also got to see the greatness of the Walt Disney Company in the United States. It’s difficult to see from here in Europe, but when you’re there you get to see the impact of the Walt Disney Company on the United States. And I discovered that we had a long way to go. We had a long way to go when it came to the service offered to our guests. And the level of courtesy as well. So when I came back here, the first thing I did was to gather my team, and I said: “Listen, I think we have some wiggle room to improve the service offered to our guests, to improve the courtesy of our Cast Members when they deal with guests.” And we created a program called Join the Disney Attitude to involve all Cast Members in this approach. That’s what I brought back from the United States. And as I was saying earlier, we’re also pioneers here at Disneyland Paris. Even though we’re very small, we’re pioneers. The Stunt Show was created here and it’s been transported to Walt Disney World. And Mickey and the Magician will surely cross the ocean, and Ratatouille too. So you see, we are pioneers even though we’re smaller. We make things happen! Daniel: I always try to… My philosophy is to try to do the best every day. And to make sure that I stay focused on my principles and on the values of our company. And through our values, to involve our Cast Members via different projects. I will tell you, the 16,000 Cast Members of Disneyland Paris are at the core of everything! Without them, we can’t do anything. They’re the ones that make a difference to our guests’ experience on a daily basis. So I try to motivate them, I try to share with them my faith in the Disneyland Paris product, and I try to carry them. It’s an everyday thing, you can’t let go, you have to stay on your toes, you have to be the one who leads, and that’s what I try to do with all Cast Members. I never let go, I’m known for that. When I want something, we have to keep going until we reach our goal. So it’s an everyday thing, but once again, the people who make a difference at Disneyland Paris are the Cast Members of Disneyland Paris. Daniel: Ironically, they’re from difficult times. I was there for — you’re going to say I’m a black cat that brings bad luck — I was at the Sequoia Lodge during the fire (September 1996). I was at the Davy Crocket Ranch during the storm of 1999, when we lost 80% of the forest. And of course, during every hardship that Disneyland Paris experienced, I was there. And my best memories come from those difficult times. And once again, my best memories are with the Cast Members of Disneyland Paris. Because the solidarity of the Cast Members of Disneyland Paris shines during difficult times. That’s when you see their generosity. That’s also when you get to see the passion of all our Cast Members. And the mutual assistance. I can assure you that during a crisis at Disneyland Paris, everyone is there. Everyone is there 24/7, and I think that if one day — but I don’t think so, because I’m getting old — if I were to move on to a different company, but I don’t think so because I already did that before coming to Disneyland Paris, I don’t think I would find this DNA we have here at Disneyland Paris, because of our Cast Members. And on a more personal level, it was when I became Entertainment Director. Why? Because you’re right at heart of the product, and you can’t imagine how good it is to be right at the heart of the product. And I also had the production team, so that means I would get sketches from designers and then we’d bring the designers’ drawings to life. I worked on several productions: there was the parade for the 15th Anniversary, The Lion King show, and every time you start with a piece of paper and you make it real. And that’s something you can only experience here at Disneyland Paris. And so, that’s it for my best memories here at Disneyland Paris. Jonathan: A perfect conclusion, Daniel. Phew, that was a lot of information to take in, wasn’t it? Daniel covered so many topics and announced so many things during his discussion. But I think what really stood out was his genuine passion and love for Disneyland Paris. He wasn’t just going through the motions like a typical businessman. He truly understands and cares about the resort. “Pizza Planet is finished” and will not be returning. It will be replaced with a new events tent.